We are a leading Manufacturer of shell tube heat exchanger, shell and tube heat exchanger and ms shell and tube heat exchanger from Coimbatore, India. 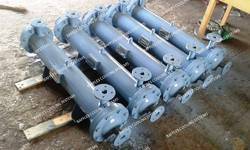 Shell Tube Heat Exchanger is a device which is used for reducing heat for processing fluid. 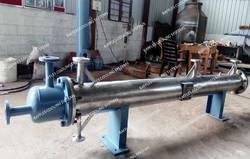 Shell and Tube Heat Exchanger is a device which is used for reducing heat for processing fluid. Its widely used in this type of all the industries. Its constructed shell side and tube side. In shell side have no of tubes accumulated and passed hot fluid passes through shell side . Cold side ,fluid passes on the tubes . Its have one ,two three ,four and mutli pass based on the design specification . Fluid kept maintain in turbulence range.We have dealing in all heat exchanger for all the Industrial applications areas. With our vast industry experience, we are prominently engaged in manufacturing MS Shell and Tube Heat Exchanger. Shell And Heat Exchanger is a device which is used for reducing heat for processing fluid. Its widely used in this type of all the industries. Its constructed shell side and tube side. In shell side have no of tubes accumulated and passed hot fluid passes through shell side . Cold side ,fluid passes on the tubes . Its have one ,two three ,four and mutli pass based on the design specification . Fluid kept maintain in turbulence range.We have dealing in all heat exchanger for all the Industrial applications areas.